massive dark object may be lurking on the edge of our solar system, according to scientists. 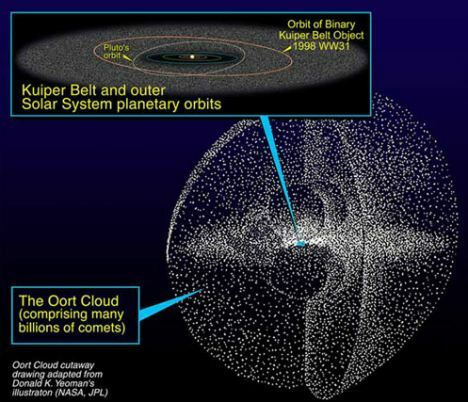 Most comets that fly into the inner solar system seem to come from the outer region of the Oort cloud - a region of icy dust and debris left over from the birth of the solar system. The cloud starts from a point about 93 billion miles from the Sun and stretches for around three light years and contains billions of comets, most of them small and hidden. Now new calculations suggest a large object that is up to four times as big as Jupiter could be responsible for sending them in our direction. The scientists have analysed the comets in the Oort cloud and deduced that 25 per-cent of them would need a nudge by a body of at least Jupiter size before they changed orbit. Astrophysicists John Matese and Daniel Whitmire at the University of Louisiana came up with theory said that 'something smaller than a Jovian mass would not be strong enough to perform the task'. They believe that our solar system has a hidden 'companion' that has so far remained undetected. The scientists have been studying the cloud using WISE, Nasa's infra-red space telescope that is capable of detecting dark objects. Matese said: 'I think this whole issue will be resolved in the next five to 10 years, because there’s surveys coming on line that will dwarf the comet sample we have today. About 3,200 long-period comets are known, one of the most famous being Hale-Bopp which was visible to even the naked eye during 1996 and 1997. Halley's Comet, which reappears about every 75 years, is a 'short-period' comet from a different part of the Solar System called the Kuiper Belt. If it exists the new planet is so freezing cold it is difficult to spot, researchers said. It could be found up to 30,000 astronomical units from the sun. 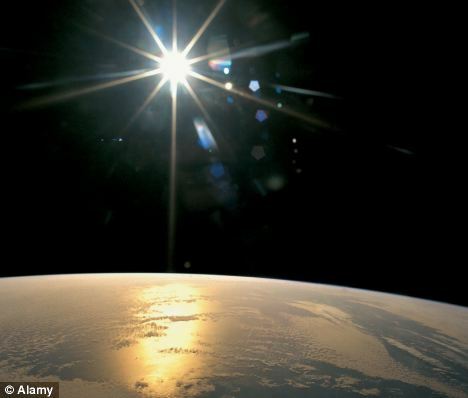 One AU is the distance between the Earth and the sun, about 93 million miles. Scientists have already proposed that a hidden star, which they call 'Nemesis,' might exist a light-year or so away from our sun. They suggest that during its orbit it would regularly enter the Oort cloud, jostling the orbits of many comets there and causing some to fall toward Earth. These occasional comet showers could be why the mass extinctions on Earth are so regular, some scientists believe. The research appeared in the online edition of the journal Icarus.